Saddle Making is one of the few trades that hasn’t changed much through the years. Other than some very minor use of power tools, most saddles are made the same today as they were in the Old West. Skilled craftsmen who have apprenticed to learn their trade create each saddle by hand, often custom fitting each to fit the horse and meet the needs of the rider. Any skilled saddle maker will tell you that a properly-made saddle must be comfortable for both the horse and rider. Just as people are all different, so are horses. A saddle that fits one horse well won’t necessarily fit another. This is why saddle makers will have a number of different styles of trees, each of which is available in different sizes. 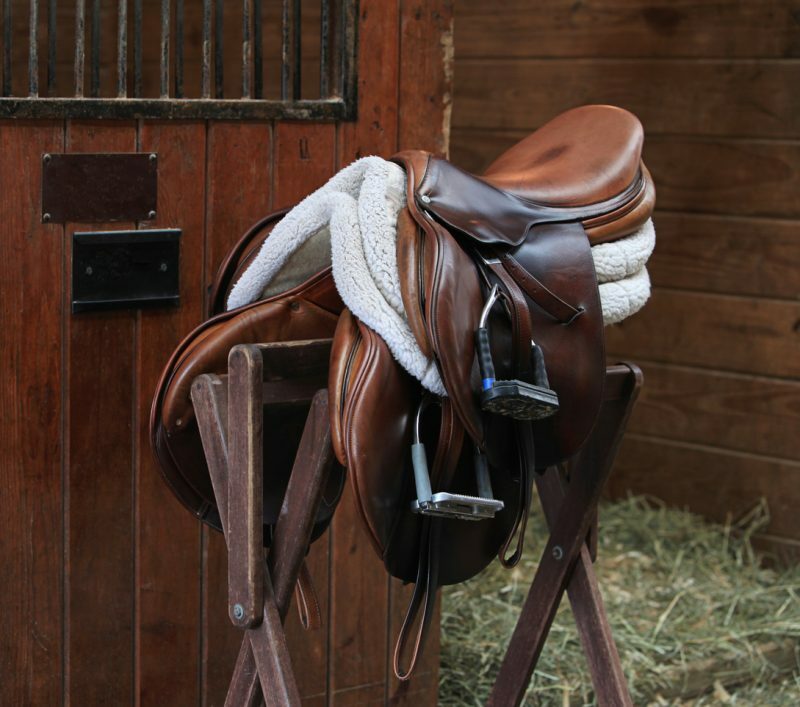 An improperly-made saddle can cause irritation and even injury to a horse, and anyone who has ever ridden knows how bad an uncomfortable saddle can be. Riding horses without a saddle can be harmful to the horse as the rider’s weight is directly on their spine. The American Indians solved this problem by essentially kneeling on the horse with their calves in contact with either side of the horse’s spine. This kept their weight off the sensitive spinal column so that they would not injure their horses. Of course, this required incredible strength in the legs of the Indians. They had to both support themselves and hold on to the horse with them, and nobody wants to fall off a galloping horse so strength was important! Saddle making is an art – both in the design of the saddle itself and the decorative carving into the leather. This is more than decorative as it condenses the leather, making it stronger and adding to the saddle’s life. But it is the creativity of this carving that impresses the casual viewer. Saddle makers don’t do their carving according to some pattern they buy; instead, they design each saddle individually, which makes each one a unique piece of art. You can look at a hundred saddles made by the same hand and find that each of them is unique – even if they all have a floral design. 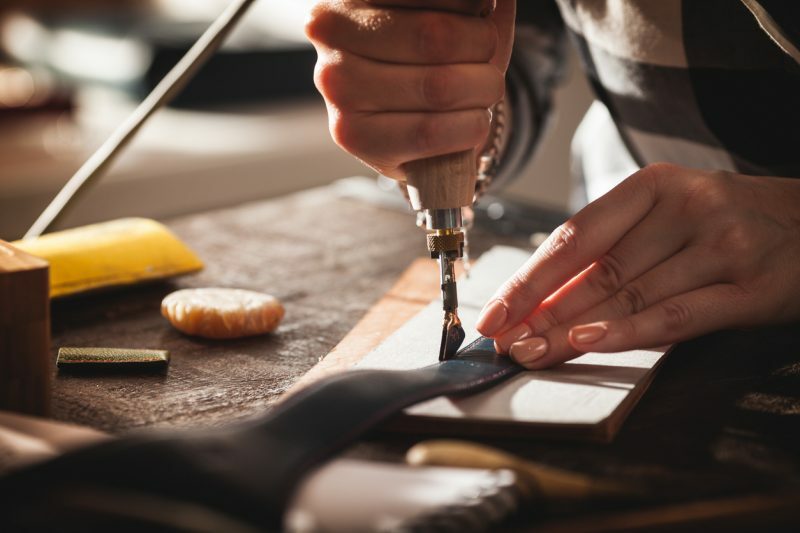 Not only does the saddle maker design the carving right onto the leather, but they usually design the saddle itself right onto a hide by sketching out the individual parts by hand. These parts are laid out in a particular way to use the natural variance in the hide’s thickness and stiffness in the most effective way. Not all saddles are the same as each is made to meet the needs of the rider. Many people recognize the difference between a Western and an English saddle, but few recognize the differences between the different styles of Western saddles. Saddles for roping or use on a cutting horse are made differently than those used for more normal riding. The seat of the saddle can consist of as many as eight layers of leather, providing padding between the tree and the rider. Each piece has to be formed by hand, just as all the other curved pieces. Any wrinkles in the hide need to be removed so they don’t form a lump in the top layers. Curving the leather pieces is done by first soaking the parts in water. They are then wrapped in wool blankets and left overnight, allowing the water to soak uniformly through the leather. Then, the part is ready for forming. This is first done over a mold to get close to the right shape and then onto the saddle itself to finalize the shape. Saddles are mostly stitched together, but the stitching is inset into the leather so that it is below the surface. To do this, a groove is cut into the leather, and then it is pierced to create a line of holes for the stitching. Keeping the stitching below the surface of the leather helps to prolong its life as it will not wear from rubbing. Many of the formed pieces – especially for the horn, pommel, gullet, and cantle – also need to be thinned before shaping. The center of these pieces will often be a thick pad of leather, while the edges are thinner. This helps with both the forming and stitching of the parts. While saddle making and harness making were different trades, there would usually only be one saddle or harness maker in a town – if there even was one. This meant that the saddle maker could easily find themselves doing a wide variety of other work, doing repairs and modifications to just about anything made of leather. 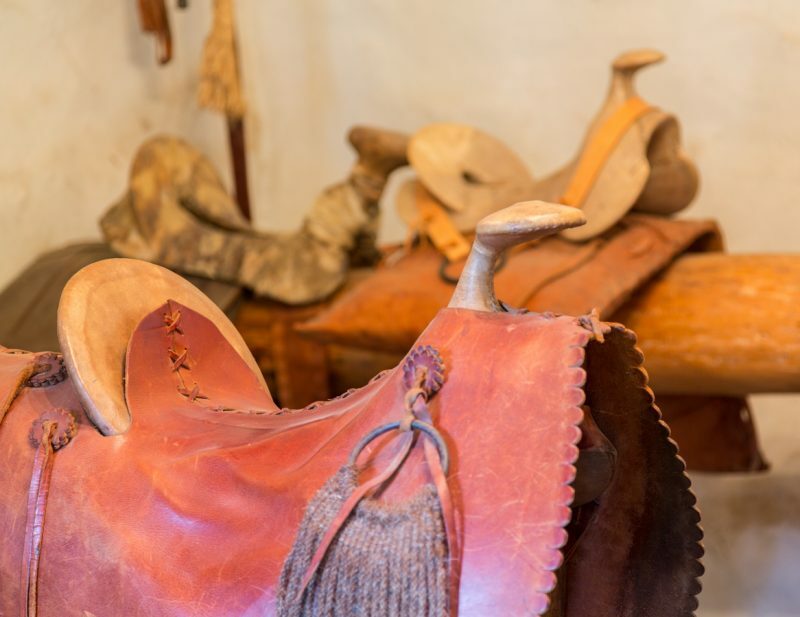 Hand-crafted leather saddles in La Purisima mission California. One of the more common additions to the saddle maker’s trade was making harnesses for draft horses. This is actually considerably simpler than making saddles as the harness is mostly just a series of straps sewn together or attached together with buckles and other fittings. Nevertheless, in most cases, only the saddle maker had the necessary tools for this work. While not only cowboys rode and had saddles, the Western saddle is most notably identified with cowboys. Many of the distinct design characteristics of the Western saddle came about to meet the needs of cowboys, as they used their horse and the saddle mounted on it in the execution of their duties. The saddle horn is the most notable of these design elements. This was originally developed for use in roping, a common part of the cowboy’s work. The saddle horn provided someplace for the cowboy to snub his lariat (rope) around to take up some of the shock of a roped steer reaching the end of the rope. This meant that the horn needed to be strong and attached to the saddle tree firmly – normally by bolts. Saddle horns are not all the same; there are different styles of them. They have been made out of brass, steel, and wood. In order to withstand the abuse they regularly received, they were covered with rawhide. Roping saddles will usually have a “horn wrap” over this, which is made from a tough material such as mule hide to take the wear and protect the horn from damage. The cantle (back of the seat) of the Western saddle is also considerably different to that of an English saddle. While they vary considerably, with nine different types of Western saddles, they are generally considerably taller than English saddles. Once again, this is due to the needs of the cowboy, who had to maintain his seat during activities like cutting and roping. 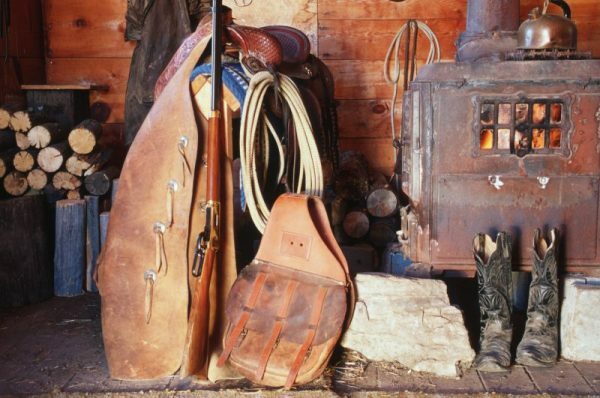 Because the saddle was so important to a cowboy’s work, it was often the most expensive possession he owned. Even cowboys who did not own a horse would often own their saddle. These cowboys would ride the horses belonging to the ranch and usually have a few horses assigned to them. 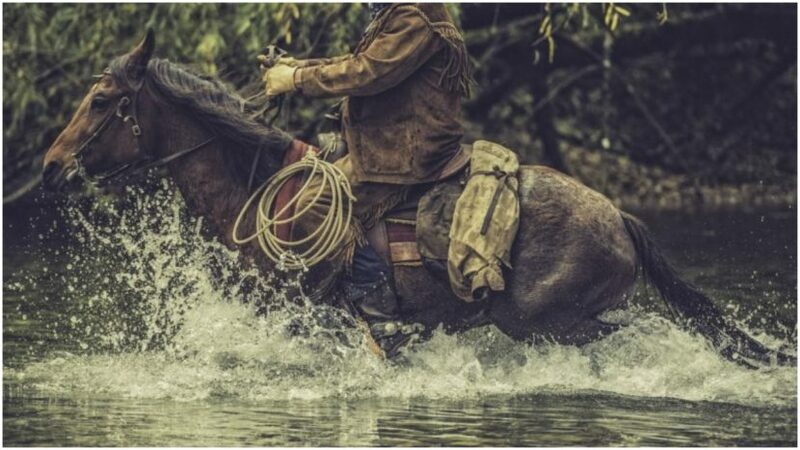 Even in cases where cowboys owned their own saddles, they would need additional horses to ride – especially on a trail drive, as they could easily wear out a couple of horses each day. 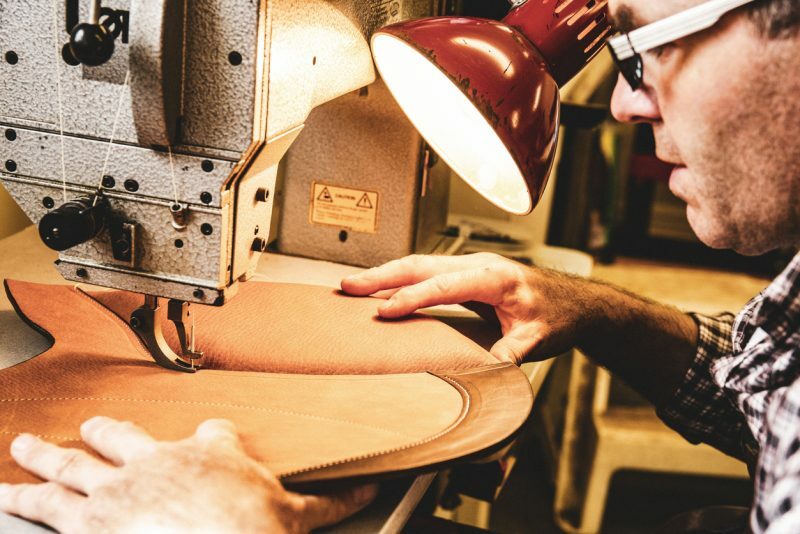 Saddle making is becoming a lost art, with factories taking over what was once a very important trade. 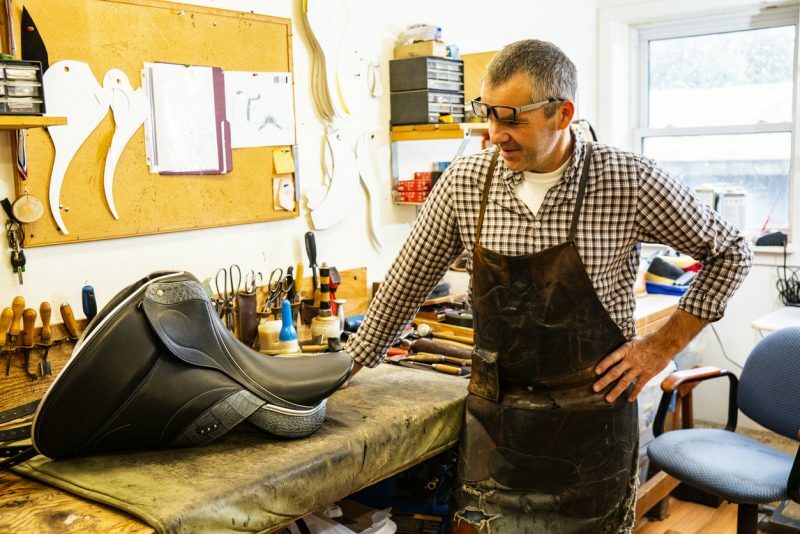 Chances are it would be hard to find a saddle maker to make you a saddle in a post-disaster world unless you happen to live in an area where there is a lot of ranching or other riding. Saddle making is complicated enough that it’s doubtful that people will be able to learn it in such a time. If we were ever faced with a disaster that destroyed the electric grid, we may find ourselves turning back the clock and looking to horses once again as a primary means of locomotion, power, and transportation. One problem with that is that there are many fewer horses here in the United States today than there were in times past (and we have more than anyone). There just wouldn’t be enough horses to go around. If you are planning on using horses for transportation in such a situation, it would be best to get your horses, saddles, and anything else you would need now. If you wait, you’ll probably end up doing without them.